Lately, quite a lot of people have been asking me about childhood in the Middle Ages. What was it like? And were they really treated like little adults, as our old history books used to say? The first misconception that’s worth clearing up is that children were, as they always have been, both loved and cherished by their parents. I’ve explored this a little bit elsewhere, but it bears repeating. Though there were culturally different ways of showing that love, it was as powerful as it is now. The number of children a couple had didn’t reduce the amount of love they had, either. While people tended to have more children than they do now (although contraceptives were known, they were against the church’s teachings), children weren’t considered expendable or replaceable, even if a new baby was given the same name as a deceased child. Yet may thou have thy will. At this point in time, the trend was towards humanizing Jesus and Mary, so it’s not surprising that the two are imagined in a tender moment that must have been extremely familiar to readers and listeners. From a young age, children were expected to help out at home with tasks suited to their age and development. They could care for animals and siblings, fetch and carry, cook, and even help out in the family business. Tiny fingerprints left in medieval stoneware show that children were involved in all aspects of family life, while coroner’s reports sometimes give us an idea of what children were permitted to do. As now, children were susceptible to household accidents, or drowning, falling, or being hurt by animals as they played and explored. Some boys were able to attend local cathedral or monastic schools to learn the trivium and quadrivium. Usually, these boys were being groomed to become members of the clergy, either in the lower orders (as clerks), as priests, or in higher positions (such as bishops, doctors, or lawyers). These boys might also have been dedicated to the monastic life by their parents, who would give the monastery a donation to secure their place. Girls were given to convents in the same way to spend their lives in cloistered seclusion. This wasn’t a way to get rid of children (although there were always some cases in which parents couldn’t afford to raise them), but rather a spiritual commitment stemming from the very fact that children were the most precious things parents had to offer to God. Despite the love they bore them, both parents and teachers were allowed to beat children in an attempt to correct their behaviour, using hands or switches. In fact, it was encouraged, with adults citing the same argument that has been used for millennia: “Spare the rod, spoil the child.” Perhaps unsurprisingly, schoolboy rhymes about hating nasty teachers have survived. Noble boys were often fostered in other households where they might receive the training they needed to become successful adults. Boys as young as seven began training for knighthood with wooden swords, bows, and small horses or ponies, learning by doing and by watching the knights with whom they lived. They also learned to read, and sometimes write, in both their native tongues and in Latin. Girls were not the fragile dolls we might expect them to be, either, as they were taught from girlhood to run their households, as they would on behalf of their future husbands whenever they were absent. This meant understanding everything from budgeting, to delegating, to making clothes by hand, to throwing a feast for hundreds. 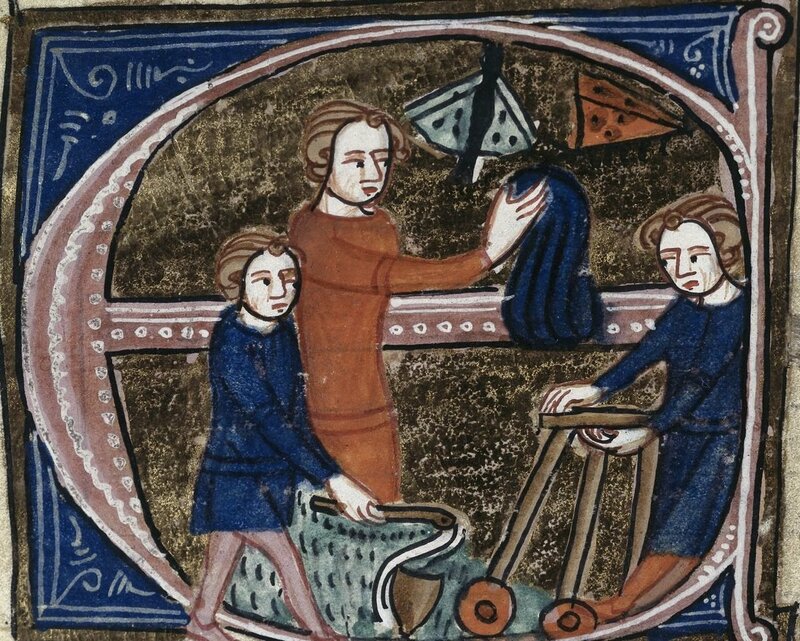 Despite possible accidents or cruel masters, household chores, and time away from home, childhood in the Middle Ages was not a dour time. Children were encouraged to play, and adults ensured that they got the opportunity. Archaeologists have discovered everything from toy knights and horses, to tiny cooking pots and pans. Gerald of Wales even describes building sandcastles with his brothers as a child, although Gerald, sweetly, built sand monasteries, instead. Children played ball games, stick games, and sports, as well as what we’d now call board games like backgammon and chess. In the cloisters of Canterbury and Salisbury cathedrals, nine men’s Morris boards carved into the benches by medieval children are still visible today. They say it takes a village to raise a child, and the medieval community was committed to caring for its children, with the church, local lords, or godparents stepping in to help out when needed, and to care for orphans. Even with all this care and support, just as now, not every child had an idyllic upbringing. Still, just as now, medieval childhood was full of fun and games, learning and exploring, trial and error, tears and laughter. For more on medieval childhood, check out Nicholas Orme’s Medieval Children, and for more on medieval archaeological finds, see Medieval Life by Roberta Gilchrist.